shirls gardenwatch: Dear Friend and Gardener – a book review and delight! Dear Friend and Gardener – a book review and delight! Never making it to my bookshelf, christmas or birthday wishlist, despite being picked up in bookshops many times over the years, when an email came in asking me if I wanted to review a copy of the New illustrated edition of ‘Dear Friend and Gardener’ introduced by Fergus Garrett… I was thrilled and smiling all day!! Sorry, I just couldn’t make this book a giveaway to readers as was also suggested. I wholeheartedly agree with the quote above that appears on the back cover of this book. What an absolute joy this book has been to pick up and read over short and long spells since I received it back in early September. Would I recommend it? I think you might guess the answer there… YES! So what makes this book special for me - I was to discover a few things I didn’t expect. The first thing I found was a renewed love of hand letter writing after years of ‘letter writing’ via PC template newsletters and word docs with inserted photos. Through reading just a few chapters, I genuinely took out a pen and writing pad from my drawer and began a letter to my friend. How surprisingly liberating it was! Skilled plants people and garden writers who travelled the world, Beth and Christopher, were caretakers for two quite different gardens in England. Ordinary gardeners (what are they?) have to contend with what our unpredictable weather throws at us – Beth and Christopher were no different. Beth in particular, gardens with a low level of rainfall which was a challenge that she turned into an experiment with her gravel garden. I remember watching a television programme on this not long after it was finished and was very keen to see it for myself which I did a couple of years later on a bus trip to the Chelsea Flower Show. I wasn't disappointed. Reading through the high quality pages of my hardback copy of Dear Friend and Gardener (I adore nice paper too) brought great personal insights in to the daily lives of the two celebrated friends. The picture of the two friends, on the back cover of this book, makes me smile once again as I recognise the background as the topical garden at Christopher’s garden at Great Dixter. If I have done my sums correctly, Beth was 74 years young when they began these letters and Christopher (known as Christo to his friends) would have been 76 years. They were both actively involved in the running of their gardens then too. Christopher died in 2006 aged 88. 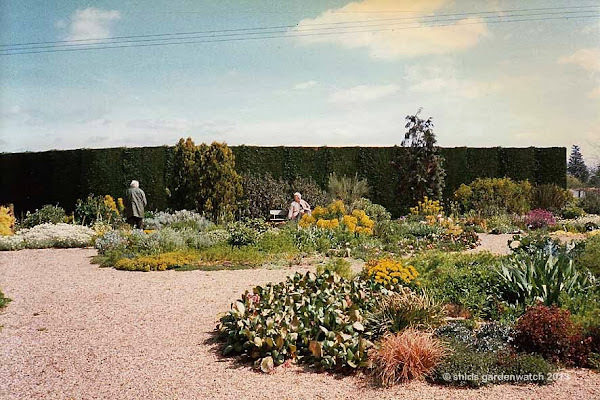 Beth Chatto's Gravel Garden, taken on my visit of Thursday 23rd May 1996. 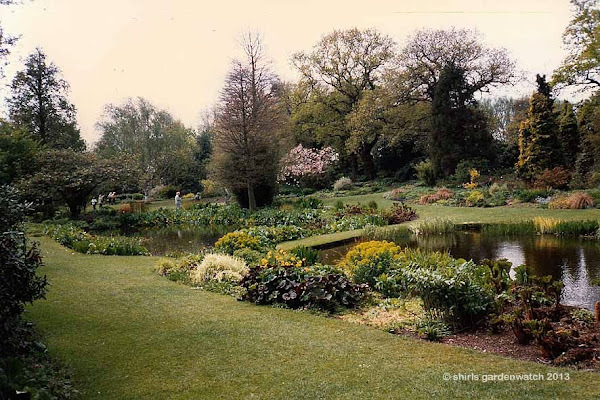 Beth Chatto's Water Gardens, taken on my visit of Thursday 23rd May 1996. Are you guessing what I checked next? Yep… the dates of the letters… did they match my visit? Close enough, I’d say! What a thrill. You can see the actual plants Beth refers to in the quote below above in my photos taken just a few days before – I got out a magnifying glass and went image searching online to verify this. What a fun, first book review this was becoming. A Great Dixter visit on a family holiday in 2000, when my daughters were young, meant that I could picture garden/house areas Beth and Christopher were chatting about. We took the tour of the house but unfortunately other visitors spoilt it a bit by making us feel uncomfortable for joining the guided tour with young children - well behaved, interested 7 & 9 year olds they were too I should add. It was still nice to see inside the house at Great Dixter and I could easily imagine Christopher living and entertaining there, even before reading the letters. It was a scorching day on our visit which curtailed our garden wandering a little. However, an area that was roped off caught our attention. Someone was doing an interview with Christopher that day which added to our visit. We never saw Christopher – just the empty chair. I remember seeing lots of bold tall yellow blooms in the garden that day too. FERGUS GARRETT has been Head Gardener of Great Dixter since 1992 and worked closely with Christopher Lloyd during the garden’s most exciting developments. 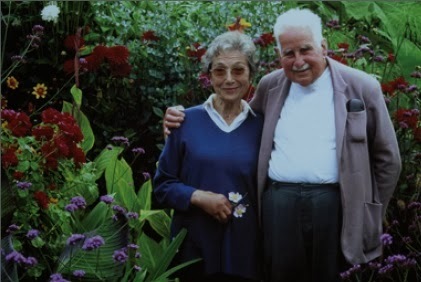 After Christopher’s death in 2006, Fergus became Chief Executive of the Great Dixter Charitable Trust, and he continues to manage and lecture on Great Dixter and gardening. Fergus first worked at the Beth Chatto Gardens as a student more than 20 years ago and has remained a close friend of Beth’s ever since. In this edition Fergus writes a new introduction. A Great Dixter Film, narrated by Fergus Garret, 7 min 21 sec. Great views inside the house. What fun, you can easily put Christopher Lloyd in the house above now and you get a flavour of the chat between the two… if you haven’t gone for a nap yourself! Please forgive my indulgent long review (regular blog visitors will be used to my odd lengthy blog posts – I do have a warning in my sidebar too). I have genuinely had fun with this and hope it’s been an entertaining read for you too. The Exotic Garden at Great Dixter, taken on my visit of 20th July 2000. Despite gardenwatching and blogging for seven years now, what keeps me going is continuing to learn too. Sharing ‘stuff’ that I have come across is so much part of that. It is with this in mind I have one more quote from Dear Friend and Gardener that I’d like to share (it’s been hard cutting my list back). Okay, that’s the chat from me almost over now and shortly I’ll hand you over to Beth and Christopher chatting in videos. 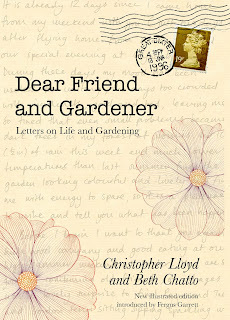 Before I go, I’d like to share one final delight that I discovered on reading Dear Friend and Gardener and it was to be found in the final letter from Beth to Christo. You can imagine what a thrill it was when I realised that this favourite video I had enjoyed so much was being filmed during the time of letter writing for Dear Friend and Gardener. Beth’s final letter to Christo describes the excitement of a publicity party for a video. Once I read who made the video I gave the biggest smile… Wow! The Beth Chatto Gardens video, 2 min 20 sec clip, try HD quality. Dear Friend and Gardener, new revised edition 2013, inside back jacket. Christopher Lloyd in Tropical Garden at Great Dixter, first 3 mins 30 secs of GW clip. 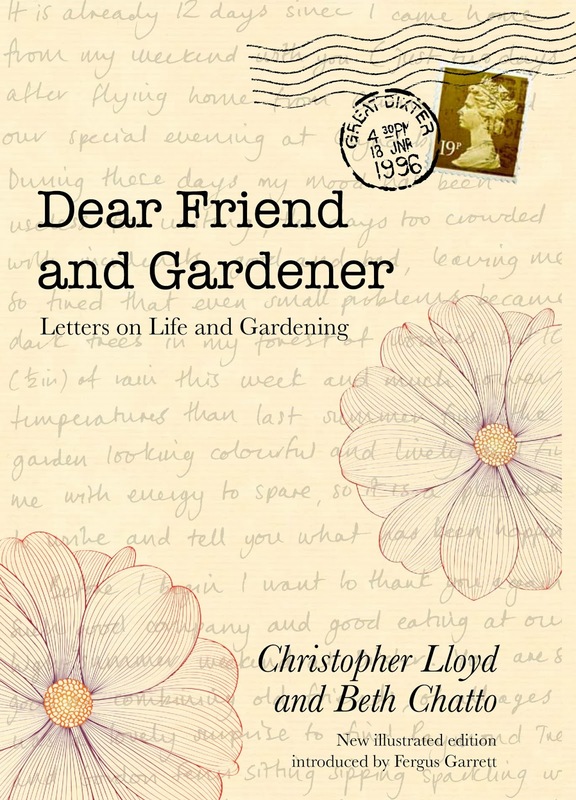 To order a copy of Dear Friend and Gardener for £16 including p&p* (RRP £20), telephone 01903 828503 or email mailorders@lbsltd.co.uk, and quote the offer code APG16. *UK only - Please add £2.50 if ordering from overseas. Great Dixter I'm sure would be a great place to visit - a special garden like Hidcote that we visited a couple of years ago. I've bought quite a lot of perennials from beth Chatto's nursery too. What a lovely blog to read on a cold, dark afternoon. Maybe I'll get the book if I'm good. Wonderful post, full of lovely stories. I'll be dropping a big hint to hubby about this book. Lovely to read your bookreview! I have the book already for years and it is such a delight reading. 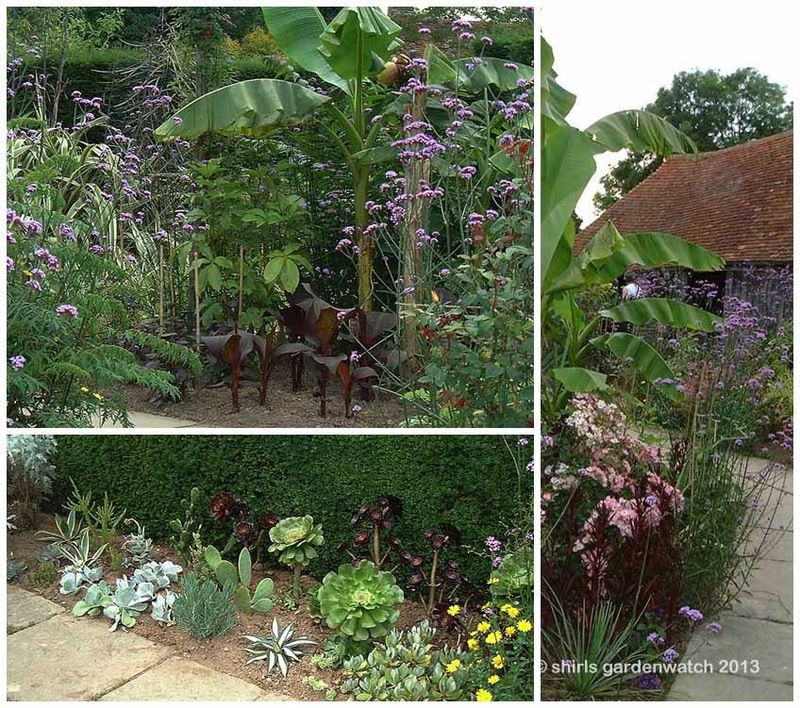 I too visited both gardens, Great Dixter and Beth Chatto´s garden, they are both different but beautiful. I loved this book,ideal reading for a cold winter day. I went to Beth Chatto's garden on Friday and it was looking fabulous even at this miserable time of the year. I enjoyed looking at your blog; very interesting and lots to read. Enjoyed your excellent review of what is a great book Shirl. I read it first time around in the last century :) I would imagine that if you have not already read it that you would also enjoy ' Beth Chatto's Garden Notebook' which is in diary format. Your post has got my brain in overdrive now, as our one and only visit to Elmstead Market was in the 90s but I can't remember which year! I particularly loved their discussions on daily stuff like listening to music and their conversations with their staff etc. The book covered a lot of topics giving us a great insight into their lives which included Beth’s husband being ill too which was clearly hard for her at that time and expect for the couple of years after too before he died.